Our current research work focuses on the experimental and theoretical studies of quantum optics, especially applications in quantum information processing. We investigate the interplay of interactions between light and matter, pursue robust long distance quantum communication, scalable quantum computation and quantum simulation. More information on current research projects and the experimental setups can be found here. Our work on studying the quantum criticality and Tomonaga-Luttinger liquid is now published on Phys. Rev. Lett.. It has been highlighted as Editors' Suggestion. See viewpoint by Thierry Giamarchi, from University of Geneva, Switzerland: "Theory for 1D Quantum Materials Tested with Cold Atoms and Superconductors". Ring-exchange interactions are basic elements needed for realizing topological quantum computation. These interactions and anyonic statistics have been engineered using ultracold atoms in an optical lattice. A preprint article is online at Nature Physics now. 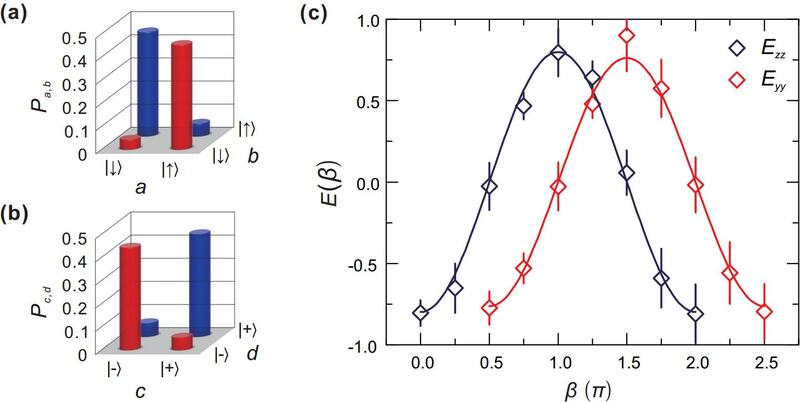 We experimentally investigate the quantum criticality and Tomonaga-Luttinger liquid (TLL) behavior within one-dimensional (1D) ultracold 87Rb atoms. Based on the measured density profile at different temperatures, the universal scaling laws of thermodynamic quantities are observed. The quantum critical regime and the relevant crossover temperatures are determined through the double-peak structure of the specific heat. In the TLL regime, we obtain the Luttinger parameter by probing sound propagation. 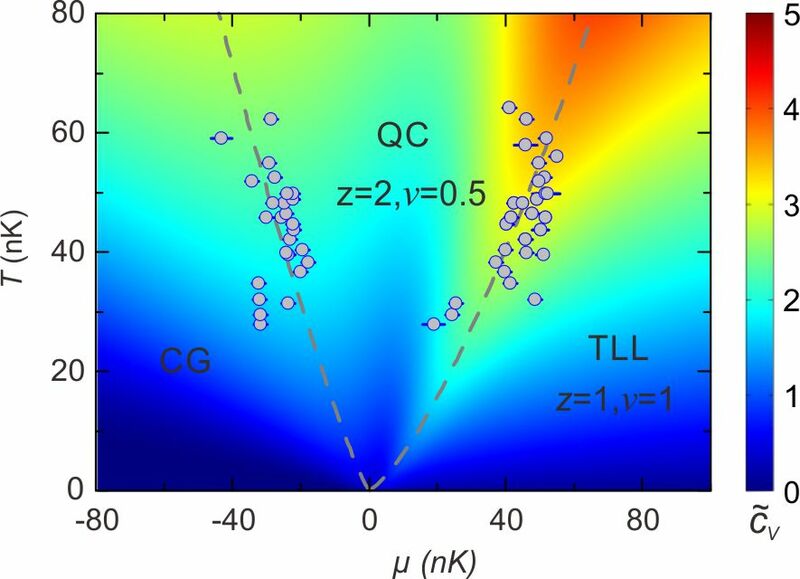 Furthermore, a characteristic power-law behavior emerges in the measured momentum distributions of the 1D ultracold gas, confirming the existence of the TLL. A preprint article is on arXiv now. Congratulations to Andreas Reingruber for his sucessfull thesis defense! His thesis is about the work on the lattice project, with title of "Two- and four-body spin-exchange processes in optical lattices". 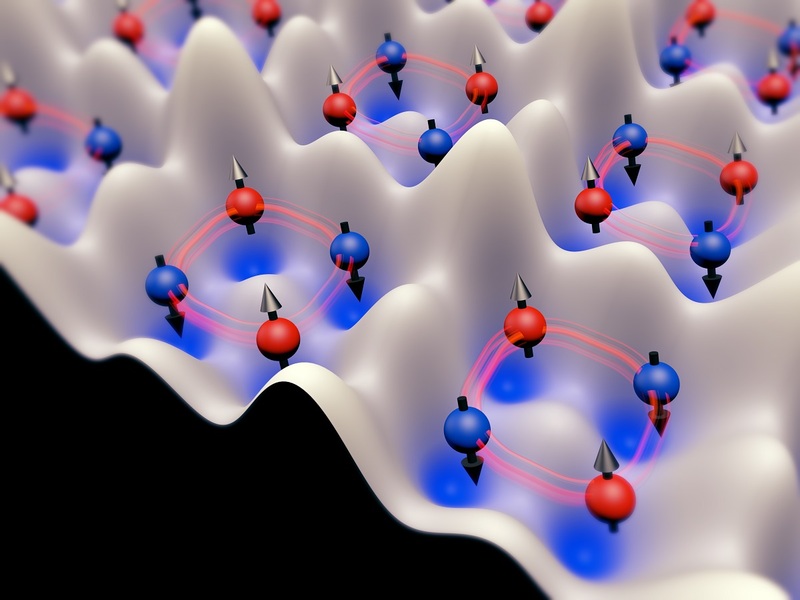 Ultracold atoms in optical lattices hold promise for the creation of entangled states for quantum technologies. Here we report on the generation, manipulation and detection of atomic spin entanglement in an optical superlattice. Using a spin-dependent superlattice, atomic spins in the left or right sites can be individually addressed and coherently manipulated with near-unity fidelities by microwave pulses. The spin entanglement of the two atoms in the double wells of the superlattice is generated via the dynamical evolution governed by spin superexchange. By monitoring the collisional atom loss with in situ absorption imaging we measure the spin correlations of the atoms inside the double wells and obtain a lower bound on the entanglement fidelity of 0.79±0.06, and a violation of a Bell’s inequality S=2.21±0.08. Four-spin ring-exchange interaction is observed! Ring-exchange interactions between spins are experimental observed in a four-site optical plaquette created by a two-dimensional spin-dependent superlattice. A minimum instance of the Kitaev's toric code is simulated, and the anyonic statistics between its elementary excitations are observed. Our most recent paper generation, manipulation and detection of atomic spin entanglement in an optical superlattice. Using a spin-dependent superlattice, atomic spins in the left or right sites can be individually addressed and coherently manipulated with near-unity fidelities by microwave pulses. The spin entanglement of the two atoms in the double wells of the superlattice is generated via the dynamical evolution governed by spin superexchange. By monitoring the collisional atom loss with in situ absorption imaging we measure the spin correlations of the atoms inside the double wells and obtain a lower bound on the entanglement fidelity of 0.79±0.06, and a violation of a Bell’s inequality S=2.21±0.08. It is available online at arXiv:1507.05937. With the help of our Workshop, we moved the whole setup of optical lattice from Philosphenweg 12 to the New Physikalisches Institut Heidelberg at Im Neuenheimer Feld 226. We complement our colleagues in China on their fantastic experiment published in Nature and the corresponding article appearing in the "Bild" daily newspaper. Our recent work reported a high-performance quantum memory in which long lifetime and high retrieval efficiency meet for the first time. By placing a ring cavity around an atomic ensemble, employing a pair of clock states, creating a long-wavelength spin wave and arranging the set-up in the gravitational direction, we realize a quantum memory with an intrinsic spin wave to photon conversion efficiency of 73(2)% together with a storage lifetime of 3.2(1)ms. This realization provides an essential tool towards scalable linear-optical quantum information processing. 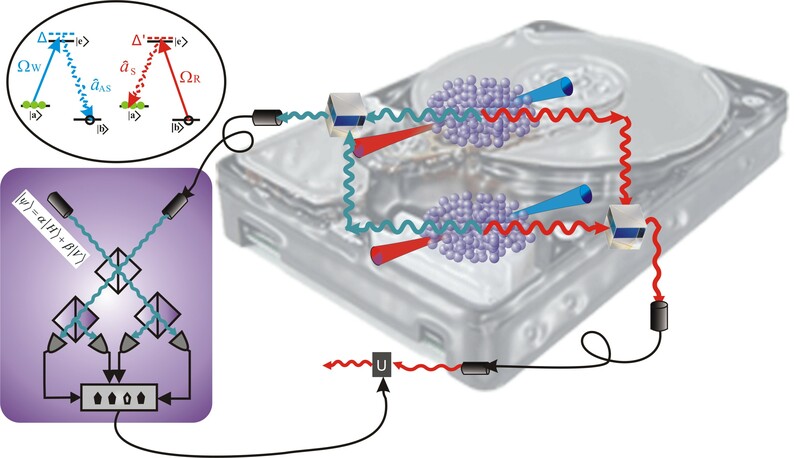 Our recent work reported a source of entanglement generated in an event-ready manner by conditioned detection of auxiliary photons. This scheme benefits from the stable and robust properties of spontaneous parametric down-conversion and requires only modest experimental efforts. It is flexible and allows the preparation efficiency to be significantly improved by using beamsplitters with different transmission ratios. We have achieved a fidelity better than 87% and a state preparation efficiency of 45% for the source. This could offer promise in essential photonics-based quantum information tasks, and particularly in enabling optical quantum computing by reducing dramatically the computational overhead. Our recent work presented an experimental investigation into extending the storage time of quantum memory for single excitations. We identify and isolate distinct mechanisms responsible for the decoherence of spin waves in atomic-ensemble-based quantum memories. By exploiting magnetic-field-insensitive states—so-called clock states—and generating a long-wavelength spin wave to suppress dephasing, we succeed in extending the storage time of the quantum memory to 1 ms. Our result represents an important advance towards long-distance quantum communication and should provide a realistic approach to large-scale quantum information processing. It was published at Nature Physics. Our recent work realize entanglement swapping with storage and retrieval of light, a building block of the BDCZ quantum repeater. 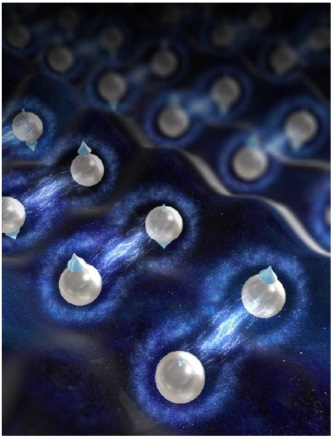 We follow a scheme that incorporates the strategy of BDCZ with atomic quantum memories. Two atomic ensembles, each originally entangled with a single emitted photon, are projected into an entangled state by performing a joint Bell state measurement on the two single photons after they have passed through a 300-m fibre-based communication channel. The entanglement is stored in the atomic ensembles and later verified by converting the atomic excitations into photons. Our method is intrinsically phase insensitive and establishes the essential element needed to realize quantum repeaters with stationary atomic qubits as quantum memories and flying photonic qubits as quantum messengers. Our recent work demonstrate teleportation between photonic (flying) and atomic (stationary) qubits. In our experiment, an unknown polarization state of a single photon is teleported over 7 m onto a remote atomic qubit that also serves as a quantum memory. The teleported state can be stored and successfully read out for up to 8 µs. 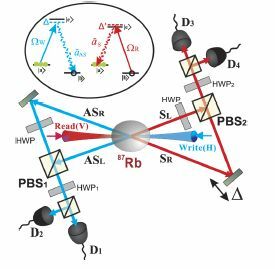 Besides being of fundamental interest, teleportation between photonic and atomic qubits with the direct inclusion of a readable quantum memory represents a step towards an efficient and scalable quantum network. It was published at Nature Physics (Press Release). 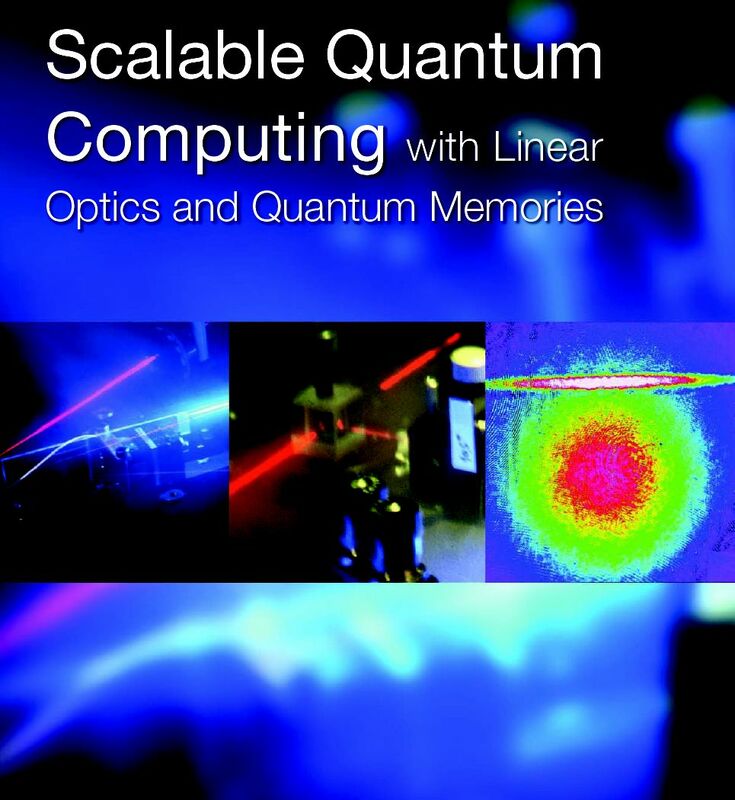 Our recent review work of scalable quantum computing was published at Optics & Photonics News. Our recent work demonstrated a novel way to efficiently create a robust entanglement between an atomic and a photonic qubit. 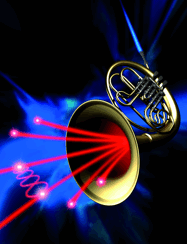 A single laser beam is used to excite one atomic ensemble and two different modes of Raman fields are collected to generate the atom-photon entanglement. With the help of built-in quantum memory, the entanglement still exists after 20.5 µ;s storage time which is further proved by the violation of Clauser-Horne-Shimony-Holt type Bell’s inequality. The entanglement procedure can serve as a building block for a novel robust quantum repeater architecture [Zhao et al., Phys. Rev. Lett. 98, 240502 (2007)] and can be extended to generate high-dimensional atom-photon entanglements. It was published at Physical Reveview Letters. Our recent work reported an experimental realization of one-way quantum computing on a two-photon four-qubit cluster state. This is accomplished by developing a two-photon cluster state source entangled both in polarization and spatial modes. With this special source, we implemented a highly efficient Grover’s search algorithm and high-fidelity two-qubit quantum gates. Our experiment demonstrates that such cluster states could serve as an ideal source and a building block for rapid and precise optical quantum computation. Our recent work created independent, synchronized single-photon sources with built-in quantum memory based on two remote cold atomic ensembles. 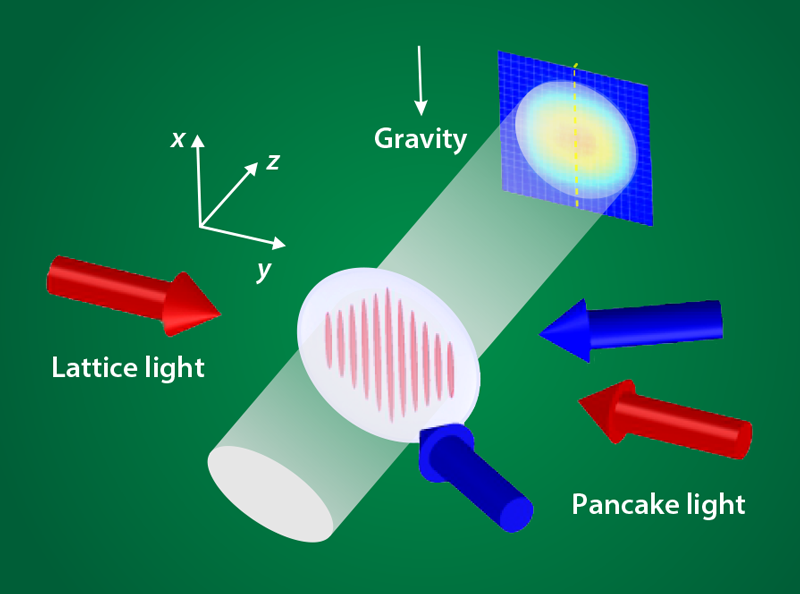 The synchronized single photons are used to demonstrate efficient generation of entanglement. The resulting entangled photon pairs violate a Bell’s inequality by 5 standard deviations. 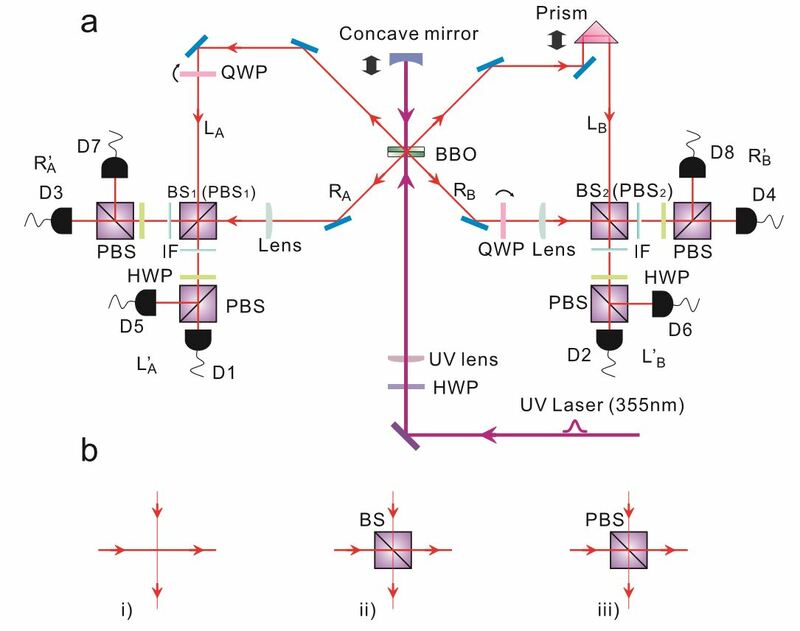 Our synchronized single photons with their long coherence time of 25 ns and the efficient creation of entanglement serve as an ideal building block for scalable linear optical quantum information processing. Our recent work presented the experimental realization of quantum teleportation of a two-qubit composite system. In the experiment, we develop and exploit a six-photon interferometer to teleport an arbitrary polarization state of two photons. The observed teleportation fidelities for different initial states are all well beyond the state estimation limit of 0.40 for a two-qubit system. 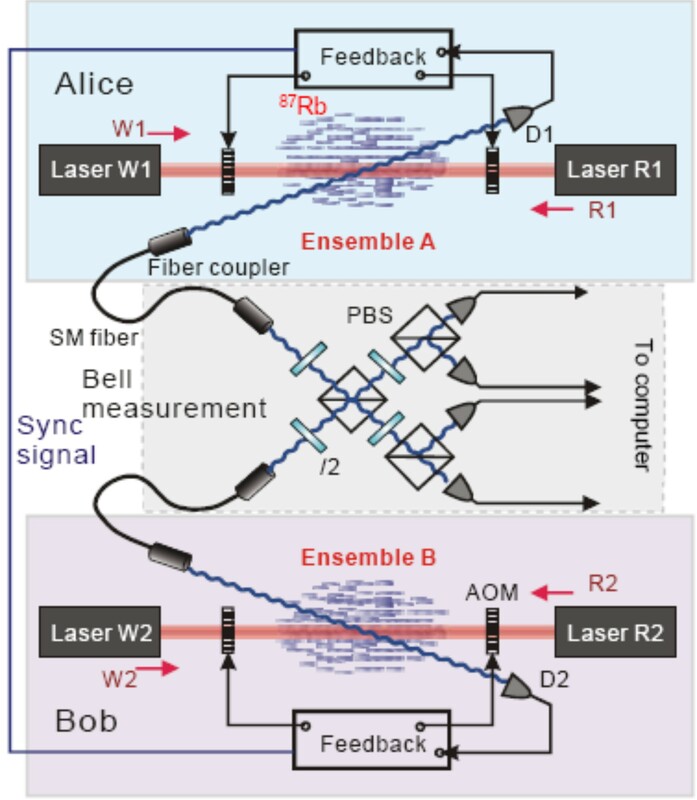 Not only does our six-photon interferometer provide an important step towards teleportation of a complex system, it will also enable future experimental investigations on a number of fundamental quantum communication and computation protocols.